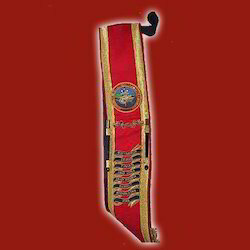 We customize drum major sashes as per clients pictures, sketch and specifications. These sashes used by the bandmaster of the military or police. Get customized sashes for birthday parties, corporate events, College events, School Functions, Annual Days, etc. All sizes available in ready stock. Standard Satin Sashes in white color base with multicolored printing as per requirement. We can make customized Sash as per your requirement. The quantity should be 50 pieces or more. With our A Year to Celebrate Personalized Sash, you can show off your years with style! 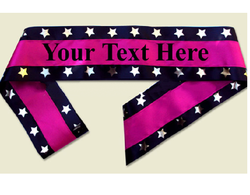 This foil sash includes an assortment of number and character stickers so you can customize it for the birthday gal. Stickers are festooned with festive stars and spots! We under take multicolour printing on Sashes Printing. Customized message/design can be printed. No minimum quantity required. Rs.100/- per piece is an indicative price. The price may vary as per the design and size. We make sash as per requirements. Supported by trained personnel, we are readily instrumental in presenting a comprehensive spectrum of Custom Sashes .